You can tell that The Grove prides itself in first class service! Wonderful property and amenities. The only negative I have for the whole place was the food service by the pool. But otherwise I cannot say anything bad. We had the best time and plan to return! We absolutely loved the property. It have a true “home away from home” feel. With full kitchens and spacious rooms, you definitely feel like you can take a few days and spend them just at the resort to take a break from the theme parks. It will be pricier obviously than name brand chain hotels, but you definitely get what you pay for in peace and amenities. We will definitely be staying here again next time we are in Orlando! Amazing resort, waterpark, pool, arcade, pier, restaurants and anything you could need. My only issue was the extra $30 a day resort fee + a parking fee. We loved the space and property amenities (spa, arcade, boating, waterpark, etc.). The rooms were spacious, well appointed and a great value for the money. We booked a 3 bedroom, 3 bath suite, complete with a fully outfitted kitchen and laundry room. The service and the food were very good. I did find it confusing to get around the property and think the signage could have been better. Also, the finishing and property maintenance could be improved. Finally, it was near Disney but, way off the beaten path so, it too twice as long for us to get to around. Overall, my family and I gave the Grove a thumbs up and would choose to stay there again. Me and my family had an absolutely wonderful stay. We loved this resort! The rooms were spacious, clean and comfortable. The suite had everything you need and the property and amenities were great! We would definitely reccomend staying here and we hope to come back. It was a great resort except for the room that was giving to us the second time. The air was broke, I had to fix the dryer after no one came after my wife called the front desk, and worst of all the water damage and mold growing on the wall. Very nice, high end hotel. Professional and responsive staff that aim to please. We stayed in a 2 bedroom unit and it was incredibly spacious and had a full kitchen with washer and dryer which was glorious for a family. it was amazing that it had such awesome amenities including many pools, a water park and paddle boats. it wasn't great to have to pay for parking each day including the resort fees, but this is normal practice now...so just be advised you will have to pay about $45 on top of each nights costs. The Grove Resort Orlando places you 7 mi (11.2 km) from Orange County National Golf Club and 9.7 mi (15.6 km) from Disney's Animal Kingdom® Theme Park. This 555-room, 4-star resort has 4 outdoor pools along with a full-service spa and a free water park. Enjoy dining at Alfresco Market, one of 3 onsite restaurants. You can sip a beverage at the coffee shop/café. Full breakfast is offered for a fee each morning from 8 AM to 11 AM. Guests can enjoy a flat-screen TV and stay connected with free WiFi. Beds sport Egyptian cotton sheets and down comforters, and the bathroom offers a soaking tub, a hair dryer, and designer toiletries. Other standard amenities include a kitchen, a washer/dryer, and a balcony or patio. The Grove Resort Orlando features a full-service spa, 4 outdoor pools, and a free water park. If you drive, self parking is USD 15 per night, and there's also a free theme park shuttle. The 24-hour front desk has multilingual staff ready to assist with tours/tickets and luggage storage. Other amenities at this spa resort include a lazy river, a children's pool, and a fitness center. Full breakfast is served daily from 8 AM to 11 AM for a fee. Alfresco Market - Restaurant open daily for breakfast, lunch, and dinner. Valencia - Restaurant and bar specializing in American cuisine. Open daily for breakfast, lunch, and dinner. Kid's meals available. Longboard Bar & Grill - Poolside restaurant and bar specializing in Hawaiian cuisine. Open daily for lunch and dinner. Kid's menu available. Element - Cocktail bar. Open daily. The Springs Bar & Grill - Poolside restaurant and bar specializing in American cuisine. Open daily for lunch and dinner. The resort has 4 outdoor swimming pools and a children's pool. A complimentary water park, a lazy river, a spa tub, and a fitness center are other recreation options. The front desk is open 24 hours a day. Driving? This property offers parking (fees apply), along with a car charging station. This property provides housekeeping every other day. For more details, please see the Promotions section or contact the property using the information on the reservation confirmation received after booking. Guests should contact this property in advance to reserve a portable crib/infant bed. Please contact the property using the information on the reservation confirmation received after booking. 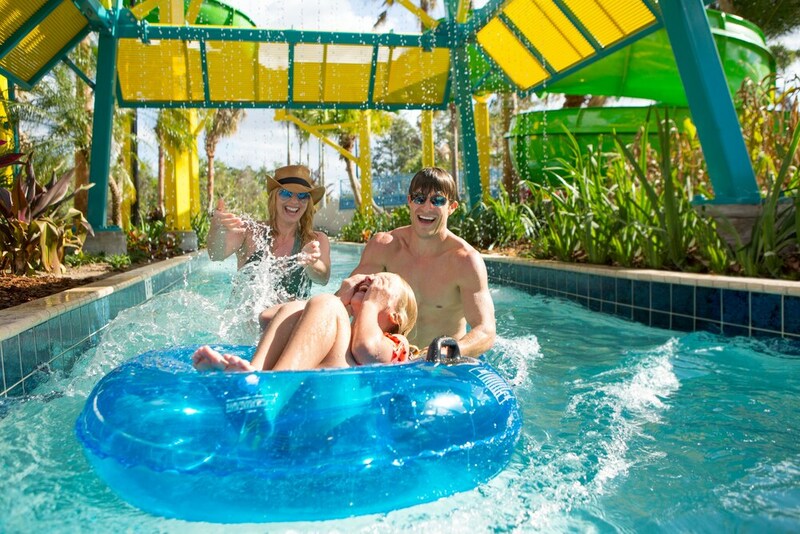 Book a stay in any room or rate category and receive access to the Surfari Water Park featuring a dual-rider surf simulator, 2 twisting tube slides, a 695-foot lazy river, and kids' activities (fees may apply). Book a stay in any room or rate category and receive housekeeping on every second day of stay OR a USD 10 resort credit when you choose to opt out of housekeeping.